Kyla’s 1st Birthday is less then a week away and I’ll be honest I’m just starting to really settle down on what we’re going to do. At first we were going to do something a little big but instead we decided to be a little more low key. Invite the grandparents over maybe a friend or two. I’ll confess this is mainly B’s idea. I still kind of want to do something big this is a BIG birthday after all. One year of Kyla. One year of our Rainbow. Whenever I think of her 1st birthday I think of Rainbows, what an amazing gift she was to our family, hand picked by her sister to brighten our days. It really shouldn’t be a surprise that I want to go big but since that doesn’t seem to be in the cards I’ll just have to DREAM BIG and with all the amazing rainbow birthday party ideas out there I couldn’t help myself if I tried which for the record I’m not! The one thing I have totally together! Kyla’s outfit! OMG now i want a rainbow bday party for the girls! these ideas are awesome! love the backdrop, the cake, the ruffle table skirt, the desserts, the photo backdrop! omg everything is so cute! Rainbow themes are one of the cutest and you can go in so many different directions! Gotta love those Rainbow Babies 🙂 They’re super special aren’t they!? So cute! My rainbow baby just turned 1 also… We did not really have a theme but we had about 50 people at our house!!! She is very loved! Wow-all of this is beautiful! I wish I had a little girl to throw this party for. 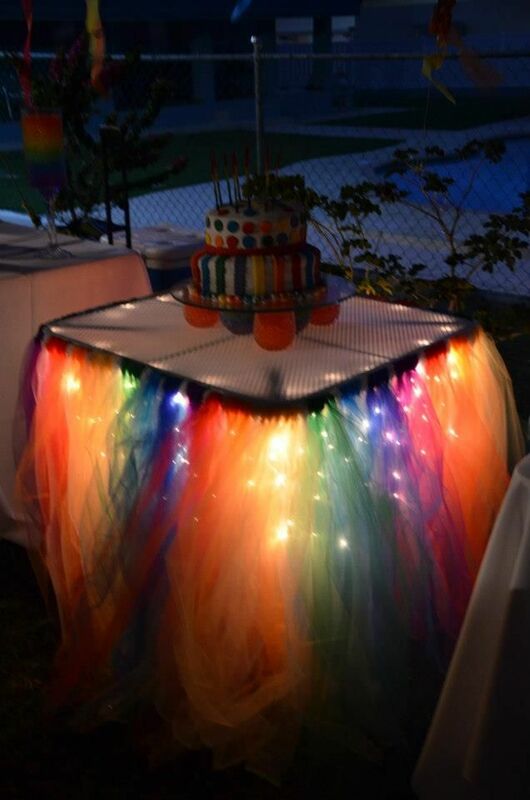 I especially love the lighted table skirt.